Resource recovery during wastewater treatment is becoming essential. Thanks to new technologies, it’s also achievable. Historically, interactions between water and energy have been considered on a regional or a technology-by- technology basis. And at the national and international levels, water and energy systems have been developed, managed, and regulated independently. But more recently, the world is recognizing that water and energy are not only connected, but tightly intertwined. It’s about time. We all need water and energy, and we all need to take part in the efforts to secure them for generations to come. Water reuse, policies and partnerships, and emerging disruptive technology solutions are vital to the cause. Specifically, there is an urgent need to shift how we view wastewater treatment and move to sustainable, strategic infrastructure solutions. Wastewater treatment plants are not waste disposal facilities, but rather resource recovery facilities that have the potential to produce clean water, recover nutrients (such as phosphorus and nitrogen), and reduce the dependence on fossil fuels through the production of renewable energy. According to the U.S. EPA, community drinking water and publicly owned wastewater systems in the U.S. use 75 billion kWh of energy per year — as much as the pulp and paper and petroleum industries combined or enough electricity to power 6.75 million homes. The EPA also recognizes energy as the second-highest budget item for municipal drinking water and wastewater facilities, after labor costs, with utilities spending about $4 billion annually on energy. Energy consumption by drinking water and wastewater facilities can comprise 30 to 40 percent of a municipality’s total energy bill. Water and wastewater utilities are highly regulated entities whose primary goals are to meet regulatory requirements for protecting public health and the environment for reasonable and fair rates. Energy efficiency has not historically been at the top of the list of priorities. Nevertheless, as populations grow and environmental regulations become more stringent, demand for electricity at water and wastewater plants is expected to increase by approximately 20 percent, according to the EPA. Moreover, as electricity rates increase, energy conservation and efficiency are issues of increasing importance for the budgets of municipalities. The lingering effects of the global economic recession have placed additional financial burden on wastewater utilities as they strive to meet increasingly strict discharge requirements with aging infrastructure in need of repair and replacement. Energy conservation, on-site generation, and renewable energy are becoming increasingly important to wastewater utilities as energy policy, energy economics, and actions to mitigate climate change converge with the need to meet higher standards of wastewater treatment. Many utilities are beginning to reduce grid-connected energy consumption at their facilities through a variety of energy conservation and on-site energy production measures. Emerging, disruptive innovations in technology combined with operational best practices are bringing into focus the opportunity to achieve energy-neutral wastewater treatment. On-site generation of energy is achieved by extracting the energy content of the organics in wastewater and converting it into a useable form. For example, advanced anaerobic digestion biosolids and biowaste processing systems use bacteria in the absence of oxygen to break down organic matter to create biogas; the biogas can then be combusted or oxidized and used for heating or with a gas engine to produce electricity and heat. It can also be compressed and used as fuel for vehicles or sold for use in a natural gas grid, while additional nutrient-rich effluent can be used as fertilizer. Designed to recycle biosolids into methane and valuable byproducts, the advanced anaerobic digestion systems are key to offering a cost-effective, lowmaintenance way to turn sludge into electricity — generating renewable energy that can be used to power the very facility producing the waste. The technology can also be used to treat biowaste, such as food waste, fats/oils/greases (FOG), etc. By combining the digestion of these external sources of organic matter with the digestion of organics in biosolids from wastewater treatment, the energy production potential of a wastewater treatment facility can be significantly increased. Consider this: A city of 500,000 people produces roughly 75,000 tons of household and commercial food waste and more than 14,000 tons of sewage sludge. By treating that waste with advanced anaerobic digestion, the value of the methane byproduct used in one of GE’s Jenbacher gas engines would produce about 5MWe of electricity alone — enough to power 10,000 homes. 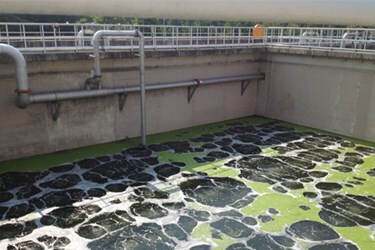 The greatest demand for energy in wastewater treatment is for providing oxygen to a biological system, which is typically achieved via forced bubble aeration. In fact, approximately 60 percent of the energy used at wastewater treatment facilities is for aeration. To achieve energy-neutral — and ultimately, net-positive — wastewater treatment, facilities require lowenergy treatment alternatives to the conventional aeration, as well as methods to enhance energy generation with existing infrastructure. New, low-energy technology solutions have become a focus of research and development activity. For its part, GE has developed a flowsheet to achieve energy-neutral wastewater treatment while removing nitrogen using the proven nitrification-denitrification metabolic pathway. Compatible with solid-liquid separation by conventional secondary clarification or membrane filtration, the flowsheet is based on a hybrid membrane-aerated biofilm reactor (MABR) process, which uses hollow fiber membranes arranged in modules and cassettes deployed in a way similar to immersed hollow fiber filtration membranes used for more traditional membrane bioreactor applications. Atmospheric air is fed down the lumen of hollow fibers, and oxygen is diffused to the biofilm growing on the outer surface of the membrane without the formation of bubbles. This technology significantly increases the efficiency of oxygen transfer, resulting in a 4x-reduction in energy consumption for aeration. This flowsheet has been compared to a conventional activated sludge system, including complete wastewater and sludge treatment with anaerobic digestion, and combined heat and power energy recovery. The results thus far are promising: with electricity consumption 40 percent lower and energy production 18 percent higher (as compared to the conventional system), leading to overall energy neutrality. As water and energy demand and supply continue to shift, managing the two resources in tandem will help regions worldwide maintain reliable and sustainable supplies of both. This is of critical importance as the global economy continues to explore new energy and renewable energy sources. But to sustain energy production and a dependable water supply, we must all gain even more detailed understanding of the interdependencies of water and energy systems, balance the needs of all users, and continue to develop technologies that reduce water use and enable water recycling while neutralizing or even creating energy. Jeff Peeters, PE, is a senior product manager at GE Water & Process Technologies with more than 15 years of experience developing and commercializing innovative technologies, including ZeeWeed membrane technology.